According to Vedic astrology, Chrysoberyl Cat’s eye also known as lehsunia or vaidurya is the gemstone of Planet Ketu or South Node of the Moon. It is a gemstone with intense planetary energies and shows effects quite fast. The factor which makes cats eye gemstone an outstanding gemstone is its significant affliction with a vengeful planet of the solar system the Ketu which denotes the south node of the moon. Cat’s Eye (Lahsuniya in Hindi) is a precious gemstone found in shades of colors like gray, black, honey and yellowish green. The planet Ketu is recognized to hold karmic influences thus, the ferocious planet affects the lives of all individuals either in a positive manner or negative manner as per their existence or presence in the horoscope of a person. To obtain the benefits from wearing cats eye gemstone, it is essential that you wear a certified natural cats eye gemstone. However, it is extremely tough to find a legit gem dealer who provides a natural cat eye stone. A gemstone quality is being accessed on the basis of the number of inclusions and clarity of the stone. A standard quality cats eye gemstone is rich on quality parameter. However, the clarity and inclusions persist in the stone that pushes this category stone a little back on this parameter. Nevertheless, the price of cat’s eye stone is less compared to fine quality cats eye gemstone. Hence, a person with a moderate budget can also afford a cat eye. The normal price of one-carat standard cat eye gemstone is 200+ INR per carat. A fine quality cats eye gemstone is high on quality parameter. The cut, clarity, and inclusions are few in this type of gemstone that incorporation enhances the value of this category stone. Consequently, due to rich quality parameters, the price of the fine category cats eye is around 840 INR Per Carat. A premium cats eye gemstone is high on quality parameter. The cut, clarity, and inclusions are few in this type of gemstone that incorporation enhances the value of this category stone. Consequently, due to rich quality parameters, the price of the fine category cats eye is around 8040 INR Per Carat. Planet Ketu resembles the characteristics of the dominant planet Saturn in some cases. Since the planet, Ketu similar to Saturn has created instant effects into the lives of its wearer as per their placement in the horoscope of an individual. While being a resident of positive or favorable houses; this planet will evoke the positive forces and assist individuals to secure spiritual enlightenment and the accomplishment of desires. The Ketu blessed cat eye stone aid gambles and horse traders to win instant money. Since the gemstone brings luck and fortune that altogether aids in dealing with monetary issues. Along with this Ketu also denotes evil spirits, negativity, black magic, and major Doshas such as kalsarpa dosh and sarpa dosh that are caused due to malefic Ketu. Therefore, wearing cat’s eye stone will help in dispelling the negative forces within the body and replenish the mind with positive thinking. The stone also prevents or safeguard a person against evil forces, black magic, traveling and serious diseases. Ketu can prove auspicious for all its wearer if it exists in the decisive positions in the horoscope. The Ketu is the significator of travel, child and wealth. Ketu blessed lehsuniya stone will prove gainful for those natives who work as a writer, scholar, engineer, scientist and judges, pharmacists for producing new drugs, doctors, poetic loving person and for those who work in the field of liquid. Cat eye stone is known favorable for meditation and encouraging spiritual enlightenment. The Cat’s Eye is known to bring luck and trigger the wearer’s intuitive and spiritual powers. Wearing a cat’s eye gemstone can help in the return of lost wealth. The energies of mystical planet Ketu help an individual’s spiritual advancement, especially as a religious seeker or evangelist. The cat’s eye gemstone can relieve mental anxiety caused by inexpression of desires. It can dissolve stress. People prefer to buy lehsunia gemstone amongst the long list of gemstones available in the market to keep themselves safe from accidents and mishaps. It is advised that people who are undergoing depression should wear cats eye gemstone to move over their distress and to live a happy life. Here we are sharing some of the common questions asked about the cat’s eye gemstone. You can also chat with our customer support executive for more details about the cats eye gemstone including price, value, origins and online buying of cats eye gemstone. Why do we wear cat eye stone? Cats eye stone effects the health conditions of its wearer positively. It is believed that sudden health-related traumas requiring crucial surgeries are mostly caused due to the malefic effects of Ketu in one’s horoscope and wearing cat eye stone benefits in nullifying the negative effects of Ketu. Are Tiger’s Eye and cat’s eye the same? Tiger’s Eye and Cat’s Eye stones are not the same things. Both have many things in common, but they are each distinct from each other. Tiger’s Eye is quartz found near iron deposits in South Africa. On the other hand, Cat’s Eye is actually Chrysoberyl, a gem formed from aluminum oxide. How do you clean a cat’s eye stone? Care & Cleaning of Cat’s eye stone: Cat’s eye stone should be cleaned in a regular process. Clean the stone with a soft polishing cloth, soapy water and with the soft brush taking care of stone. In which finger should I wear cat’s eye? Don’t wear lehsunia stone without consulting an astrologer because it may prove dreadful. Always wear cat’s eye gemstone weighing at least 7 ratti or as per the body weight. The ideal finger to adopt cats eye gemstone is the middle finger of the right hand or most probably the ring finger of the working hand. 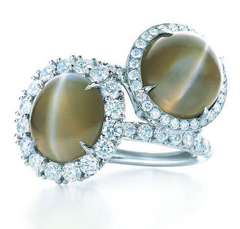 Chrysoberyl Cat’s eye is also referred to as cymophane, which is Greek for ‘waving light’. Natural cat’s eye, also known as vaidurya/ lehsunia/ bidalaksh is the gem of Ketu or the South Node of the Moon.